Both governments are accusing the other of using confusing language. 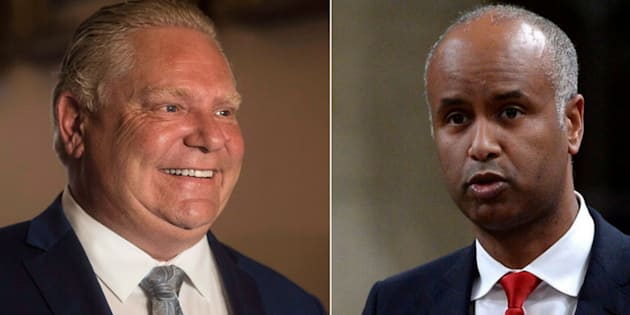 Minister of Immigration Ahmed Hussen, right, said Monday that he takes issue with the Ontario government referring to asylum seekers as "illegal border crossers." HALIFAX — The federal minister of immigration objected Monday to the new Ontario Tory government's references to people claiming refugee status as "illegal border crossers." Federal Conservative Leader Andrew Scheer weighed in with his own statement Monday, blaming Prime Minister Justin Trudeau's #WelcomeToCanada tweet in January 2017 for encouraging border crossings.